Rob Allen highlights some of the findings from the 2016 edition of PRI’s Global Prison Trends. With prison reform the centrepiece of the UK government’s legislative programme over the next year, a timely new report from Penal Reform International (PRI) provides an international context in which to consider the plans for England and Wales. Global Prison Trends, PRI’s annual survey of the state of the penal system worldwide recommends that new prisons should only be built when options of reducing the demand for incarceration have been exhausted. Encouraging greater use of alternatives to imprisonment underpins several of the key recommendations contained in the latest edition of the report, launched this week at the UN Crime Commission in Vienna. The report seeks to identify the most important developments in the use and practice of imprisonment over the last year or so. Some might consider looking for consistent themes and patterns in penal policy among the more than 200 jurisdictions worldwide a difficult task, but many of the underlying challenges facing prison systems − overcrowding, violence and meeting the needs of women and minors, cause problems in almost all regions and in countries of all income levels. International expectations of justice systems have grown over the last year through the UN’s 2030 Sustainable Development Agenda, and significant revisions to the UN Standard Minimum Rules for the Treatment of Prisoners. 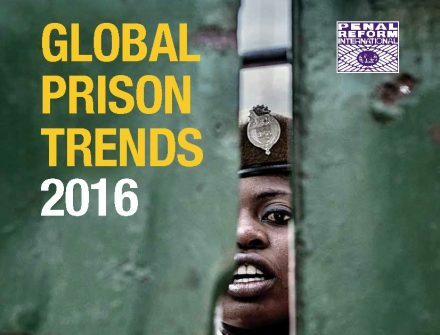 Global Prison Trends 2016 reports on a number of areas where promising progress is being made in meeting those standards. In the USA, more than half of states have introduced laws or policies which have sought to reduce the severity of sentencing in order to avert unaffordable prison growth. Probation and other forms of community based sentencing are being developed in East Africa and Central Asia to keep minor offenders out of jail, with an expansion of interest in the use of electronic monitoring in many other countries. Inside prisons, both in the US and elsewhere, there have been attempts to limit the use of solitary confinement, which is increasingly recognised as causing damage to mental health. Health ministries have assumed increased responsibility for prison health care in several European and Asian states, while in January of this year some 80 countries had ratified the Optional Protocol to the Convention against Torture which provides for independent monitoring of places of detention. Despite these positive steps, PRI reports that prisons continue to represent a humanitarian disaster in many parts of the world, struggling to meet the basic needs of detainees for food, water, sanitation and safety. The overuse of pre-trial detention is a particularly grave problem in post conflict and poorest states where the justice system may function sporadically, if at all. Appalling prison conditions not only threaten the safety and well-being of detainees (and staff) but can contribute to a sense of alienation and despair, providing a fertile breeding ground for extreme ideas. The report notes specific efforts to counter risks of radicalisation in prison, but recommends that what is needed is a comprehensive approach to prison reform which respects the human rights of prisoners and maintains a proper balance between security and rehabilitation. The key to providing that balance lies with prison staff. Global Prison Trends 2016 contains a special supplement on this topic, recommending that states assess the adequacy of prison staffing arrangements ensuring sufficient prisoner-staff ratios, pay levels and working conditions. Rob will be posting a separate blog later this week which will look at some of the issues in the special supplement on staffing in more depth.